I was moving my speakers about a week ago and I think I must've caught the wire that connects the speakers to the sub on something and it broke. What broke was the metal pat that fits into the hole in the back of the subwoofer. 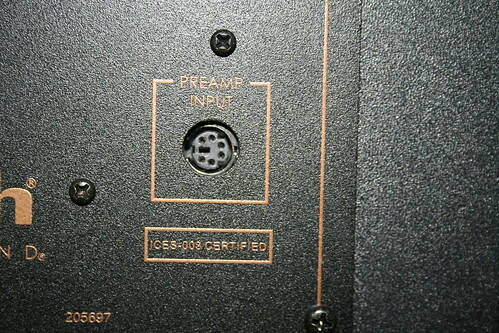 The hole is labeled pre-amp input. I'm not sure how I would fix this because it doesn't appear as if I can just replace the wire because it is connected to the speakers. I was thinking that I could maybe find a wire that had the same connecting end and cut it off and try to splice it onto the broken cable, but I wouldn't know how to go about that. If you hit it hard emought to break the connector off the cable, it is possible that you have internal damage as well. Maybe not. The connector can be replaced by splicing as you described. I think it is mister_clean that offers the service to do this for you. All comments have been positive. He also offers the connectors for sale if I remember correctly. Yes, this is true, so far no problems, lol, I do solder on new connectors for people and i also have DIY repair cables for people as well if they are in a hurry. you can Email me for either at damagetone@aim.com if you are handy with a soldering iron I can even just send you a plug and instructions for doing it yourself. So i have 3 options for people with this problem all of which are good depending on their needs.